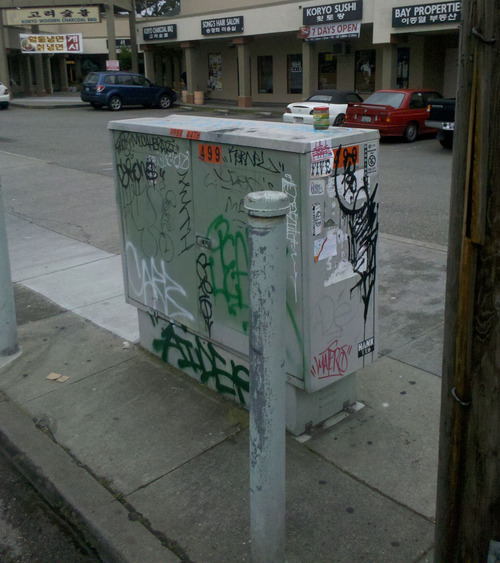 I've discussed AT&T's intention to put 726 refrigerator-sized boxes in the public right-of-way - our sidewalks - within 300 feet of every existing graffiti-covered existing AT&T box in San Francisco. I have been working with San Francisco Beautiful to prevent this plan from being implemented. The Planning Dept. gave AT&T what is called a "categorical exemption" from needing to obtain an environmental review for this plan. SF Beautiful has appealed. What we are hoping to do is convince the Board of Supervisors to agree that this review is important and necessary. I understand that there are many of you who would like to keep their AT&T service, but would love to see it improved with increased speed. This is an honorable and legitimate wish. And hopefully someday soon AT&T will have the ability to compete with Comcast - but not at our expense. The loud buzzing of the boxes' fans all day, the graffiti, the rendering of our public sidewalks more difficult to navigate for baby carriages and people with disabilities are just a few of the reasons that these boxes are not an acceptable solution to AT&T's hopes of providing more competitive entertainment to its subscribers. There are alternatives, and if AT&T is prevented from implementing this cheapest plan, you can be sure they will be back with a more acceptable one - soon. PLEASE JOIN ME IN SUPPORTING THIS APPEAL BY ATTENDING THE HEARING AT CITY HALL IN THE BOARD OF SUPERVISORS' CHAMBER - TUESDAY, APRIL 26, 4PM.